Archery Butts in Barton, near Cambridge, Cambridgeshire sleeps 4 people. Archery Butts near Cambridge has the spacious Leys meadow to the front aspect; Archery Butts combines a relaxing village setting with easy access to all the attractions of central Cambridge, just 3 miles away. Dating from the 18th century, the cottage takes its name from the green where villagers practised archery. This is an historic part of Cambridgeshire, once an aristocratic hunting ground where local villages such as Foxton, Harston and Hauxton were named after creatures associated with the hunt: foxes, hares or hawks. Barton relates to bears or boars - take your pick. The village was mentioned in the Domesday Book and the picturesque St. Peter’s Church has its origins in the 11th century. 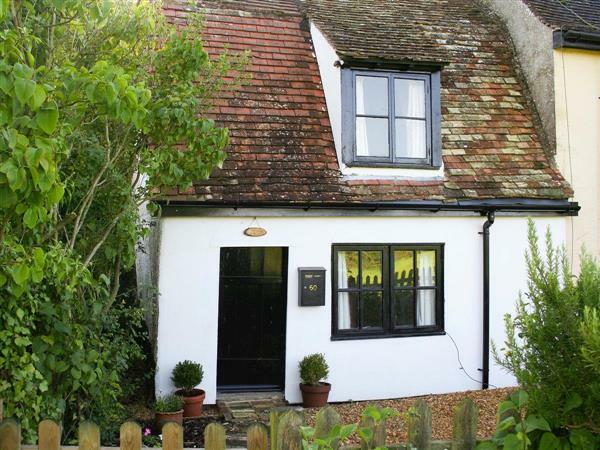 This semi-detached cottage has been sensitively restored, decorated and furnished to retain its period charm characterised by beams and original doors, while offering all the modern amenities for an enjoyable and relaxing stay. Its dining room looks out over Leys field, and the kitchen has a large window which overlooks an attractive garden. Upstairs, one of the bedrooms has dual aspect windows (one of which overlooks Leys) and a beautiful view can even be seen from the bed. A wash basin set in the original washstand also adds character to this cottage’s shower room. Transport links to the city are straightforward. An off-road cycle path from the cottage takes you into central Cambridge in around 20 minutes. Regular bus services operate from outside the cottage or the centre of Barton into the city. There are many attractive walking options, including a stroll across the fields to the famously beautiful village of Grantchester, celebrated by the poet Rupert Brooke, the location of the TV series of the same name, and the perfect place for a change of pace with tearooms and four pubs. There are also various woodland trails around the nearby National Trust Wimpole Hall Estate, which offers house and garden tours. Additional local attractions include the Imperial War Museum at Duxford, the stylish shopping opportunities at Burwash Manor and Farm in Barton, and the impressive American Military Cemetery, just a mile or so from the village. A little further afield, the cathedral city of Ely is ideal for an excursion. With numerous cycling, boating and bird watching opportunities, you will soon see why this area is so popular with visitors. Local bike hire (arranged via the owners) and car hire at the local garage are available. The shop, pub and restaurant are 110 yards from Archery Butts near Cambridge. Living/dining room: With electric log-effect fire, 32 Freeview TV and DVD player. Bedroom 2: With double bed and partial low ceiling. Electric heaters, electricity, bed linen, towels and Wi-Fi included. Welcome pack. 2 courtyards with patio and garden furniture. Private parking for 2 cars. No smoking. Please note: No children under 6 years old. There is a covered well in the garden, 25 yards away. Holidays at Archery Butts run from Friday to Friday. For a better idea of where Archery Butts is, you can see Archery Butts on the map below. Archery Butts is in Cambridgeshire; should you be on the lookout for a special offer, you can find all the special offers in Cambridgeshire. It's always worth checking to see what is on offer at the moment. Do you want to holiday near Archery Butts (UKC2308), you can see other cottages within 25 miles of Archery Butts; have a look to find your perfect holiday location.